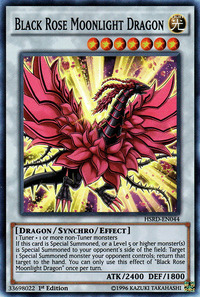 This monster is the Duel Dragon counterpart to Black Rose Dragon. In the 5D's Tracks: The 61st omake at the end of , Masashi Satō revealed that he intended this monster to be the Tuner Synchro Monster of the Duel Dragons, but was outvoted (resulting in Stardust Spark Dragon being chosen). This effect targets 1 Special Summoned monster your opponent controls. You can target a different monster than the monster that was Special Summoned. You can also target an Xyz Monster or a Level 4 or lower monster that was Special Summoned. You can only use this effect of "Black Rose Moonlight Dragon" once per turn. 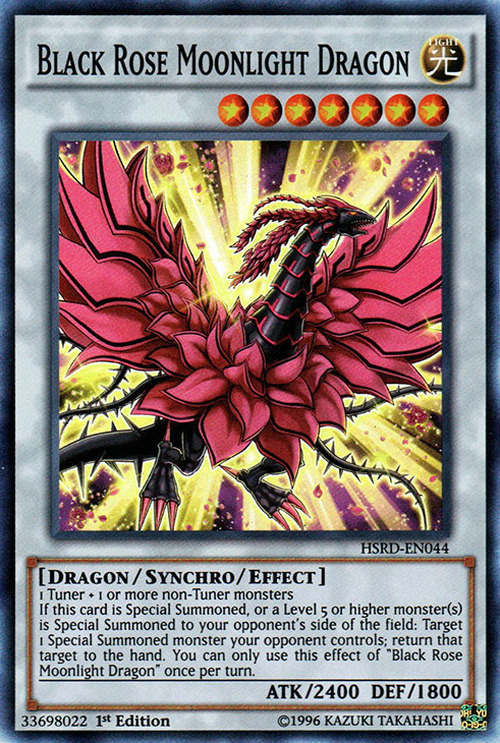 If you activate this effect, if this card is Special Summoned, then you cannot activate it if a Level 5 or higher monster(s) is Special Summoned to your opponent's side of the field. This effect cannot be activated if a monster is Special Summoned face-down.